Match Lokomotiv Moscow-Krylya Sovetov Samara Premier League the fixture is set to kick-off today 13:30 on RZD Arena. Refereee . Team Lokomotiv Moscow is located in the middle of the table. (5 place). Form team looks like this: In the last 5 matches (league + cup) gain 7 points. Leading players Lokomotiv Moscow in Premier League is: Anton Miranchuk 4 goals, Manuel Fernandes 3 goals, Jefferson Farfan 3 goals. Most assists in the club have: Anton Miranchuk 1 assists, Manuel Fernandes 3 assists, Jefferson Farfan 1 assists. Team Krylya Sovetov Samara is in the releagtion zone of the table. 14 position. 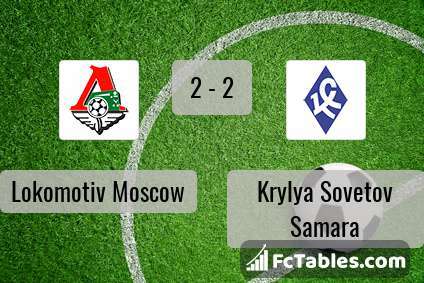 In 5 last games (league + cup) Krylya Sovetov Samara get 6 points. To defend Lokomotiv Moscow the most demanding players will be Maxim Kanunnikov 3 goals, Sergei Kornilenko 3 goals, Paul Viorel Anton 1 goals, because this season they scored the most goals for Krylya Sovetov Samara of the entire composition. Most goals developed: , Paul Viorel Anton 2 assists. Direct matches: usually ended with winning of Lokomotiv Moscow. 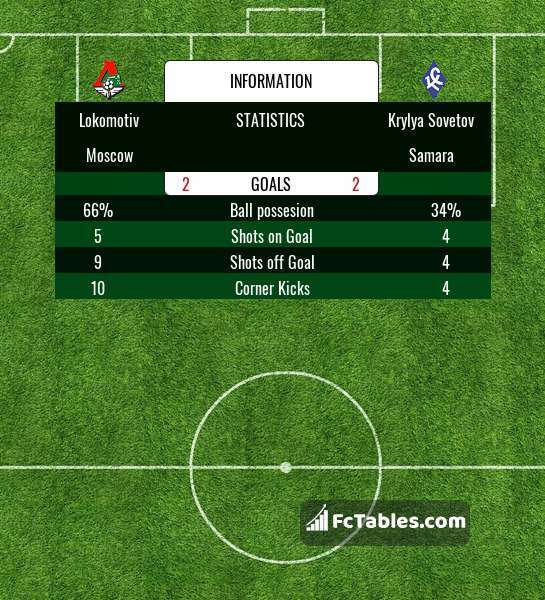 Balace of both teams games are: 18 won Lokomotiv Moscow, 9 wins Krylya Sovetov Samara, 7 draws. In 14 matches the sum of the goals both teams was greater than 2.5 (Over 2.5). On the other hand, 20 matches teams scored more than 1.5 goals (Over 1.5). In 12 matches the both teams have shot at least one goal.